This amazingly elaborate train track metropolis is one of the very significant reasons I decided to take the plunge and start this blog. I spent a good half hour constructing this for my twins to play with, while they, and my 5 month old were all soundly asleep. And I enjoyed it. 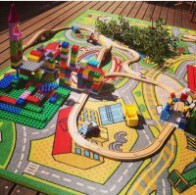 Some people might question why, when by some sheer miracle from above, my three young children were all peacefully (and more importantly, silently) sleeping…at the same time no less, was I carefully and very precisely putting together an intricate system of Duplo tunnels and railway track. Why was I not taking my rightful place on the couch, drinking coffee, catching up on Bruce Jenner’s gender transition in Who Weekly, painting my nails with Ellen on the TV, stuffing double coated Tim Tams in my mouth without fear of any pleading little voices interrupting with “can I have one too?” No you can not. The whole packet is mine. Or my more fastidious and sensible readers may even suggest perhaps I could have been making headway on the three giant baskets of clean washing I have affectionately nicknamed Mount Never-rest, which have taken up permanent residence on the bedroom floor/laundry floor/playroom floor… Wherever it is least likely to be stumbled upon by guests really (until of course I need an empty basket for yet more washing and it all gets dumped on my bed… And so the cycle of Mount Never-rest continues). Perhaps I should have been doing that. And yet. Train track motorway. Duplo recreation of Gotham city. You see, the ugly truth is that I wanted, nay needed, to start this blog because I’ve started to enjoy playing with Duplo. No, worse than that…I’ve started to look at Duplo in Kmart with the view to choosing something that I would like to put together most. When my parents recently came over with a freshly purchased Duplo airport and aeroplane for the kids, I was the one gleefully unwrapping the contents and leafing with tremblingly excited hands through the instruction manual to see all the configurations that could be created. It’s at the point when you’re commandeering your kids toys and uttering words like “no it doesn’t go like that” as your kids stifle your burgeoning creativity that you realise that you probably need to get a hobby. A grown up one. I mean, the warning bells have been going off for awhile. I’ve seen this coming, there were a few glaringly obvious moments, not least of all the level of my excitement when emoji’s were updated with skin colour variations. Which reminds me, I do need to issue official, on the record, apologies to the multiple friends who received excited text messages from me involving copious exclamation marks and screen caps of different emojis and their new alternatives. I was having a moment. I’m not proud of it. I won’t even go into the elation that comes along with the appearance of new Instagram filters. I’ve been called (by myself as well as others) “just a mum”, more times than I can count. We all get it, it’s not new. And as “just mums” we also know that being “just a mum” encompasses so many different roles that really there is no “just” about it. So many qualifications involved. Household CEO, cleaning lady, chef, sous chef, personal shopper, stylist, taxi driver, accountant, safety officer, first aid administrator, grown-up scissors operator, hostage negotiatior, Duplo construction specialist (cough)… To name but a meagre few. I think by now we’ve all read enough articles about it, and lived enough days of it to know that being “just a mum” is one of the biggest, hardest jobs, with the longest hours, worst pay and requiring just about the broadest skill set of any top ranking position, in any company, any where. And the most rewarding and fulfilling, it goes without saying. But I wanted another string to my bow. A distraction to tear me away from my children’s Duplo; a way of using my brain that doesn’t involve building the most architecturally sound base for my Duplo replica of the Petronas Towers. So, some may call me “just a mum”, I don’t mind. I know what that entails. But now I guess they can call me just a mum-my blogger too. Without wanting to sound all fan-girly and creepy, I am completely in love with your writing. I have sat here reading all your posts with tears from laughter and constantly nodding my head because you’ve said something I could have heard myself saying. 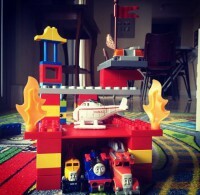 I love Duplo too! Little Miss 3 got a new set for her birthday in June. It’s a cafe style one, so cool! Chairs for the little Duplo people and even plates.